Once Brandeis started the $3.5 million renovation project at the Joseph M. Linsey Sports Center, the wife of the longtime trustee who established the athletic facility in 1964 did what she believed her husband would have done. Thelma Linsey made a $1 million gift in January to support the programs and operations at the Linsey Center. Thelma says of her late husband, “Joe took great pride in the pool. I just knew that making this gift was what he would have wanted me to do.” The Boston businessman died in 1994 at the age of 95. President Fred Lawrence announced the gift on Jan. 21 during the “Making Waves” celebration that marked the reopening of the center’s pool. Thelma, a Brandeis fellow, credited Lawrence and the board of trustees for their efforts to reopen the pool, which closed in 2008 due to major mechanical problems. As part of the renovation, the heating, ventilation and air conditioning systems were replaced, and electrical systems and lighting were improved. Additionally, two squash courts were converted into multipurpose rooms, and the locker rooms were enhanced. 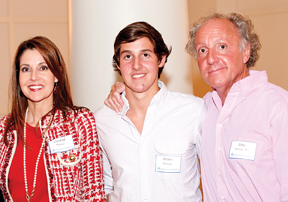 Along with generously supporting the Annual Fund, Joseph Linsey focused primarily on the sports program at Brandeis. The Athletic Hall of Fame was named in his honor to recognize his contributions. 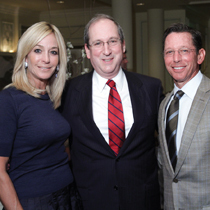 Through a recent gift to Brandeis, the Peter and Patricia Gruber Foundation has established a faculty chair in neuro­science, joining a name associated with funding science prizes with one of the leading brain research centers in higher education. The inaugural Peter Gruber Endowed Chair in Neuroscience will be Professor Michael Rosbash, a 2009 laureate of the Gruber Neuroscience Prize (along with Jeffrey Hall and Michael Young) and longtime Howard Hughes Medical Institute investigator. 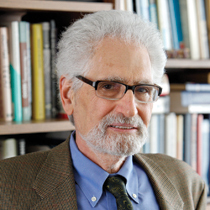 Professor Rosbash, whose research into the molecular basis of circadian rhythms has provided important insights about the brain, health and sleep disorders, directs the Brandeis National Center for Behavioral Genomics. Established in 1993, the Gruber Foundation moved its International Prize Program to Yale University in 2011. The prize program awards three $500,000 science prizes annually in the fields of cosmology, genetics and neuroscience, and funds justice and women’s rights programs through Yale Law School. 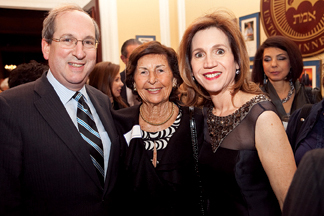 The Peter and Patricia Gruber Foundation will continue to make limited grants. 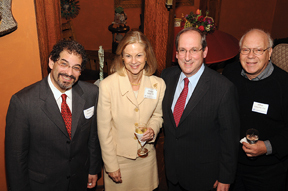 “We believe that the continuing excellence of neuroscience research at Brandeis, through the outstanding work of Michael Rosbash and with President Lawrence’s able guidance, will be an appropriate and lasting way to honor my husband, Peter,” Patricia says. Lawrence’s connection to the Gruber Foundation predates his arrival at Brandeis as president in January 2011. 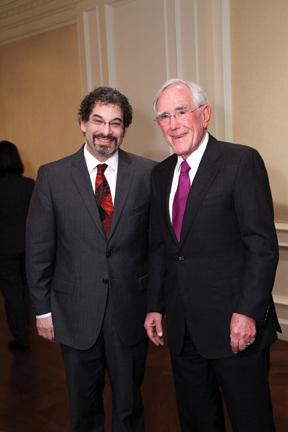 While serving as dean of the George Washington University Law School, he presided over a ceremony in which Judge Thomas Buergenthal, a GW law professor emeritus, received the 2008 Gruber Justice Prize, along with lawyer and human rights activist Jerome Shestack. 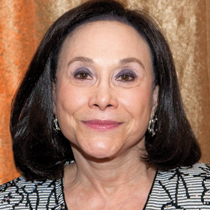 Buergenthal received an honorary degree from Brandeis last year. 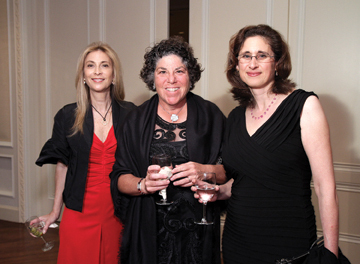 Rosbash recently shared the 2011 Louisa Gross Horwitz Prize from Columbia University with Hall (a Brandeis professor emeritus) and Young (a professor at Rockefeller University). At Brandeis, Rosbash and Hall collaborated closely for more than two decades, combining their expertise in fly genetics and molecular biology to clone the Drosophila fruit fly period gene, a key regulator of circadian rhythms. The mechanism of the molecular clock that they then discovered was later found to be universal in the biological world. Through ongoing research, Rosbash continues to advance understanding of the importance of circadian rhythms to health and disease. When I pass by the Abraham Shapiro Academic Complex these days, I often think about the man whose gift made it possible. 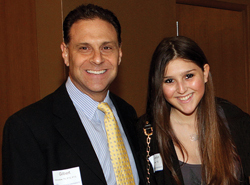 Robert Shapiro ’52, H’92, who died in January after a long battle against cancer, established the Shapiro Complex as a lasting tribute to his father, one of Brandeis’ founders. I strongly suspect the elder Shapiro would have been quite proud of the legacy his youngest child left the university. Robert carried on the family name with great distinction, giving generously of both his time and resources. A trustee beginning in 1979, he played an important leadership role in transforming the school that his father helped create into a thriving, top-tier university. He and his wife, Valya (Kazes) Shapiro ’61, a Brandeis fellow, were fixtures at events both large and small on campus through the years. Robert received an honorary degree from Brandeis in 1992 and earned the Alumni Association’s Service to Association Award in 1984 for his work as chair of the Alumni Annual Fund from 1979–1982. 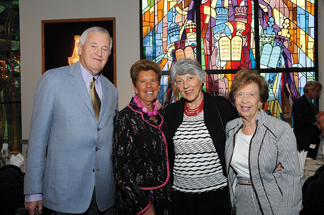 In addition to the Shapiro Complex, he and Valya also established the Robert and Valya Shapiro Endowment for Sephardic and East European Jewish Studies. A simple recitation of Robert’s awards and achievements, however, misses the essence of the man. He was a warm, compassionate individual who cared deeply about the well-being of others. Relatively late in life, after a successful career in business, Robert returned to school to become a family therapist. He also worked as a chaplain at Hebrew Senior Life. 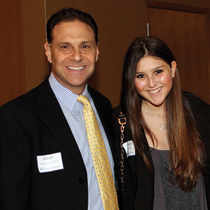 He will be missed by all members of his two families — the Shapiro family and the Brandeis family. In a twist evocative of the best of his beloved American literature, Michael T. Gilmore is giving students a retirement gift when he steps down from the Brandeis faculty in May. Gilmore, the Paul Prosswimmer Professor of American Literature and a member of the Brandeis faculty since 1975, made a generous gift to the university to establish a pair of fellowships that will provide stipends to promising graduate students in English. Among the dozens of graduate students Gilmore worked closely with through the years was Holly Jackson, M.A.’04, Ph.D.’08, now an assistant professor at Skidmore College. Jackson earned international recognition as a Brandeis grad student for her research on the race of a prominent Victorian novelist. Other highly successful students include Rosemarie Thomson, Ph.D.’93, of Emory University, a pioneer in disability studies, and David Greven, Ph.D.’02, of Connecticut College, who has done innovative work on sexuality and literature. Gilmore plans to continue his scholarship in retirement. The author of more than half a dozen books, he is working on a new project about Cambridge, Mass., as a stronghold of dissenting authors, including Henry Wadsworth Longfellow, James Russell Lowell and Margaret Fuller. 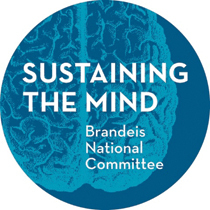 The Brandeis National Committee has launched a $3 million fundraising campaign, Sustaining the Mind, to support the university’s pioneering research into neuroscience and neurodegenerative diseases and establish an endowed scholarship fund for students in the sciences. Brandeis scientists in more than 50 different laboratories are involved in research into brain-related disorders in the hopes of gaining a better understanding of the causes of Alzheimer’s, Parkinson’s and other neurological disorders. 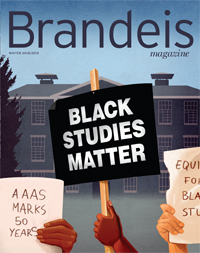 Undergraduates work in many of these labs as Brandeis prepares tomorrow’s leading scientists. 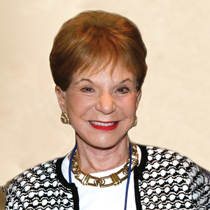 Carol Rabinovitz ’59 is serving as chair of the campaign. Learn more about the Sustaining the Mind campaign or make a gift at the BNC Website. 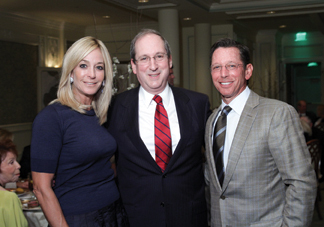 President Fred Lawrence with Heidi and Todd Schuster. Fellows Gerald and Elaine Schuster hosted a dinner at the Palm Beach Country Club, the highlight of the annual weekend gathering of Brandeis alumni and friends in South Florida. Armen Keteyian, chief investigative correspondent at CBS News, was the keynote speaker. Provost Steve A.N. Goldstein ’78, M.A.’78, was the featured speaker at the annual Norman S. and Eleanor E. Rabb Seminar. Trustee Paul Zlotoff ’72, chair of the Board of Fellows, organized two events: Susan Birren, dean of arts and sciences, spoke at the Fellows Breakfast, and Sumner and Esther Feldberg, G’08, hosted the Fellows Reception at their home in Palm Beach. 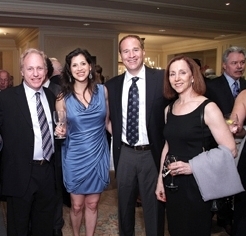 Alumni, trustees, faculty, friends and donors gathered at various venues to celebrate Brandeis. 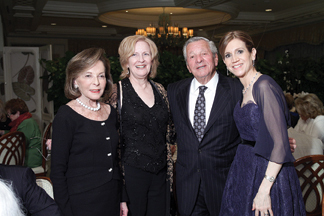 From honoring former Congressman Stephen Solarz '62 at Brandeis House and exploring the Fernbank Museum of Natural History in Atlanta, to celebrating Brandeis in Chicago and Miami, the Brandeis community was on the go this past winter.